Long absent from Antarctic shelf waters, a surprisingly large population of king crabs is consuming its neighbors and altering the habitat by digging in the soft sediments of Palmer Deep. The predatory Neolithodes yaldwyni crab species has dispersed across the shelf and established a reproducing population estimated at more than 1 million, says UH Mānoa Professor of Oceanography Craig Smith. 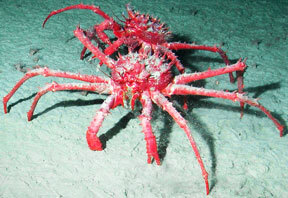 Warming of Antarctic shelf waters could allow king crabs to colonize the vast west Antarctic Peninsula shelf at depths of 400–600 meters within a decade or two, causing devastating ecological effects for major components of the unique Antarctic fauna, says Smith. Echinoderms such as sea lilies, brittle stars, asteroids and sea urchin, generally common and diverse in Antarctic waters, are wholly absent in the crab zone. Smith observed the Antarctic seafloor via remotely operated vehicle with colleagues from Duke University, Ghent University, Lamont-Doherty Earth Observatory and Hamilton College. The researchers hope to conduct population genetic studies of the Palmer Deep king crab to trace its colonization history and predict how it might disperse and colonize new habitats in coming decades. The research was funded by the U.S. National Science Foundation and the Special Research Fund of Ghent University.